Our first day of passage was amazing. We had fairly rough seas and 20-25 knot winds, which made for some speedy travel, at 9 to 10.5 knots. Tanda Malaika handled the white caps that crashed over her bow so beautifully. She rode high on the swells, then dipped down in troughs ready to rise once more. Water sprayed across the deck through the trampoline as our full sails stood firm in a perfect billow, drawing us to the north. The night was dark as we ran black (every light on the boat turned off) as an added precaution to not be seen by pirates. Danny and Aidan took first watch, Mycah , Jude and Skyler the second, and Jonathan, Emma and I the third. As we each returned to our berths after watches, Tanda Malaika rocked us to sleep. After traveling the 90 miles to our first waypoint, we tacked north west for another 80 miles to the next waypoint, past the northern parts of Nicaragua and Southern Honduras. Sailing on a run brought us following seas and calm, gentle movement. When on a run, one can hardly feel the wind as it comes from behind, and fills the sails which are set out wide. What a glorious feeling. On the second day the wind calmed and then became non existent, and we began motor sailing at about 6 knots. Danny had a Dorado on the line but while reeling it in, it broke free. He was pretty disappointed about it. We all took the same watches, and at 12:40am I awoke because of a shuddering feeling from the stern, which was not normal, and wondered why Danny hadn’t woken me for my shift beginning at midnight. I made my way out on deck to find that he had his head down in the starboard engine room, trying to figure out where the shuddering was coming from. He had lowered the sails and had both engines on low RPM’s to keep us nice and straight. While dealing with that, the bilge alarm went off because the new bilge pump Danny installed in the starboard engine room, had failed, and he and Jonathan grabbed the wet/dry vacuum (which happens to be one of the most important items to have on a boat), and sucked up the water. Before long we thought perhaps the shuddering might be a prop problem and not rudder. We decided that in the morning when it’s light we’d dive down to see if anything looked wrong with them. We once again raised the sails, the breeze had increased nicely, and we sailed without shuddering at 6 to 7 knots. I looked at my phone after all this time and was puzzled to see that it was just 12:07am. I told Jonathan that I thought we had found another Bermuda Triangle. It ends up we had crossed a time zone, and were set back an hour. Before Danny retired to his berth, he and I stood together on the bow, looking up at the dark sky which was spread so thick with beautiful bright stars. We watched many falling stars shoot through the sky, and after he’d gone to bed, Jonathan and I continued to see many, many more. On the third day when we awoke, I put on mask and fins after we had turned into irons to slow the boat down, and dove down to check rudders and props. Aside from seaweed tangled around them, I saw nothing wrong. I used my dive knife which I had firmly strapped to my thigh incase any large creature decided to come after me, and cut the seaweed away. Danny continued his search in the engine rooms for the problem. After a thorough investigation he determined that the port sail drive had lost a seal. This is not good news at all, because we cannot use that engine without the seal. The engine can run but cannot be put in gear. We aren’t certain, but will most likely need to have Tanda Malaika hauled out to fix it. Roatan does have a haul out station so we’ll see what comes. From the second waypoint, to the third, we had a 177 mile passage to make, and the day was been filled with the usual fun and games and relaxing for everyone. The creatures did their school work, then started reading. As the days pass on a passage, we all get goofier and more creative in amusing ourselves. Mycah became a different creature! We tossed out overboard a message in a bottle. Danny did a fantastic job landing a 43” Dorado!!!! Finally! I was supposed to scoop it up in the net but was too busy squealing and trying to get away from it to accomplish that. It was big and flopping all over the place with a ticked off look in its eye. The creatures gathered around to learn again how to fillet a fish. Due to the fact that we have not entered the Marina at Fantasy Island in Roatan before, and knowing that there are many reefs there, we decided to stop for the night in Guanaja, Honduras, which is an island 30 miles before Roatan. In the morning we will continue on to Roatan in the daylight so we can see the reefs. It’s a really good rule of thumb when cruising, to never enter a marina that you’ve never been to, at night. It prevents colliding with things. A pod of about 20 dolphins escorted us for a while. They were so beautiful as the were bow riding and playing in the wake created by the boat. Finally we entered the little bay outside Guanaja just at sunset. We passed many homes on stilts, some of which were quite fancy, like the Villa on Dunbar rock, for instance. 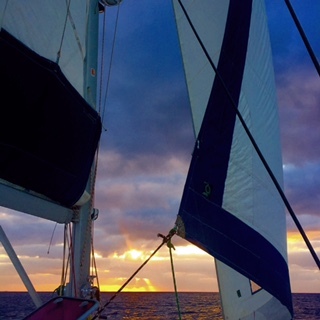 We dropped anchor and I got busy preparing a delicious Dorado (Mahi Mahi) dinner just as the sun set.